Guns N’ Roses has been heralded as the greatest rock n roll band on the planet. During the late 80’s and 90’s the hedonistic rock gods Axl, Slash, Izzy, Steven and Duff scored sold out stadium concerts on the way to multi-platinum success. During it all, original drummer Steven Adler stole hearts and headlines with his insane antics. But Steven was soon crippled by a tragic heroin addiction that led to him to being kicked out of the band he helped found. At the center of this maelstrom stood Steven’s mother, Deanna Adler, the GNR-proclaimed “first fan” of the group. Deanna was there at the beginning in 1983, when school chums Steven and Slash were building their street cred on the Sunset Strip. Deanna witnessed it all but has never told her incredible story, until now. 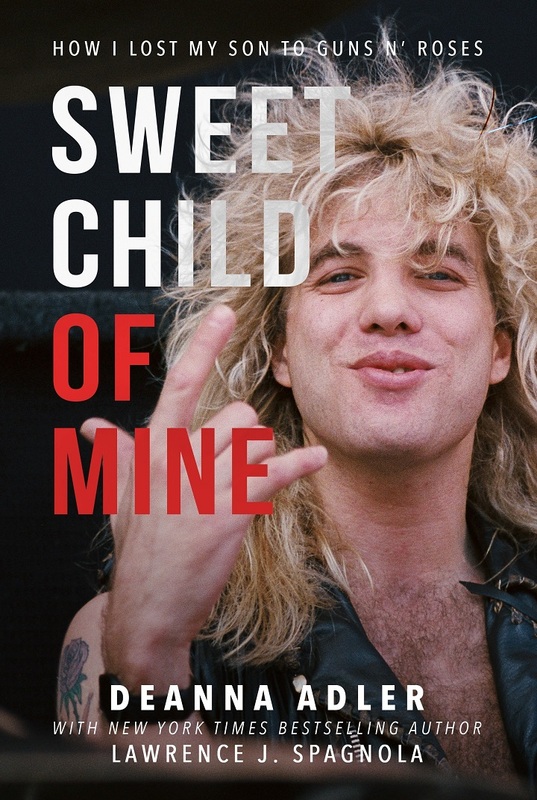 In honest, direct prose, Deanna gives an unflinching account of her son Steven’s drug fueled ascent to becoming the co-founder of Guns N’ Roses, and his subsequent fall to drugs and alcohol in the book “Sweet Child of Mine: How I Lost My Son to Guns N’ Roses.” In one of the most brutally raw, revealing books written on substance abuse, Deanna delivers a powerful, inspirational message of hope to anyone dealing with opioid addition. In addition to Deanna’s incredible story of a mother’s devotion to her infamously self-destructive son, “Sweet Child of Mine” exposes the growing widespread abuse of prescription drugs, a dangerous national epidemic. Readers will discover that Dr. Howard Kornfeld, Steven’s Opioid Rehab doctor in 1995, prescribed dozens of drugs, including anti-anxiety, and sleeping and pain pills that totaled over $2,000.00 a month. Deanna confronts Dr. Kornfeld, the pharmacist, and Big Pharma but is politely stonewalled. She shows us the doctor’s prescription print-out as evidence of the staggering number of drugs prescribed to Steven. The final shock is when we discover that Dr. Kornfeld is the same doctor who is brought in, over 20 years later, by music legend Prince at the time of his passing. Through over 25 failed rehab attempts, multiple suicide attempts, two heart attacks, and a debilitating stroke, Deanna refused to give up on Steven. Today Steven is clean and sober, back on the road and triumphantly touring with Slash, Duff, and Axl on the newly reunited Guns N’ Roses tour. “Sweet Child of Mine’s” message is simple and clear: one can despair but never lose hope, and never quit. Deanna believes the best is always yet to come and for readers, the inspirational rewards are immediate, and real.